Abraham Klein talks about his late daughter who died from a drug overdose. Brooklyn, NY - An Orthodox Jewish Brooklyn man who became an outspoken advocate for troubled children after sharing the story of his daughter’s lost battle with substance abuse had high words of praise for a new program launched by Brooklyn District Attorney Eric Gonzalez in conjunction with the NYPD and the City Council to give those charged with misdemeanor drug offenses the option of treatment and counseling in lieu of a prison sentence. Abe Klein, whose 20 year old daughter Malky died of a heroin overdose in the summer of 2017, was one of several people who spoke on Tuesday at a press conference announcing Project CLEAR (Collaborative Legal Engagement Assistance Response), which would have participants undergoing an assessment so that they could be referred for appropriate services. The District Attorney’s Office would decline to prosecute any individuals who comply with the recommendations made for them, and in addition to waiving the requirement to appear in court on the misdemeanor charge, all associated arrest records would be sealed. Speaking from his own experiences with his daughter with whom he shared an exceptionally close and loving relationship, Klein said that nearly all of those who abuse drugs have experienced some sort of trauma in their lives. “Over the past 20 years, we have lost way too many of our dear sweet children to drug abuse and addiction because we have not fully brought to our consciousness that people using drugs need more love understanding compassion, care and not less,” said Klein. Sending those who have a drug problem to prison is pointless, according to Klein, who explained that addicts turn to drugs as a way of escaping the painful realities of their lives. “Sick people don’t need to be punished and to learn a lesson in a cold prison, but rather they need to be nurtured back to health in a warm, loving and caring environment,” said Klein, who praised Project CLEAR for its life saving potential. The program’s announcement comes 20 months after then Acting-District Attorney Gonzalez spoke about his intention to stop punishing drug abusers with prison time, and instead hire drug counselors in a VIN News interview (http://bit.ly/2tvnxks ). 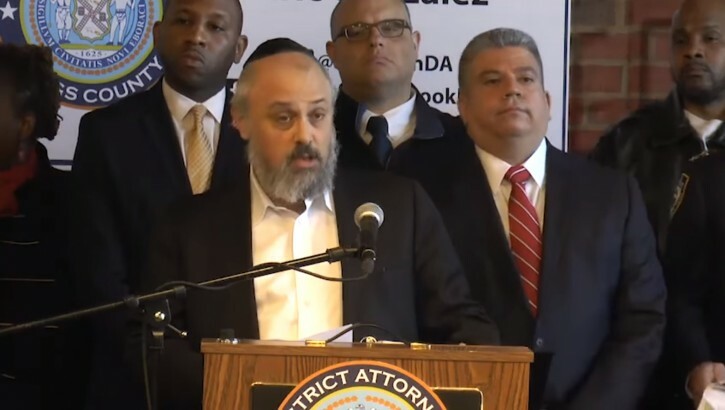 Acknowledging that addiction had become a problem even in the Orthodox Jewish community, Gonzalez said that he intended to create rehabilitation facilities that would be culturally sensitive and would be respectful of religious needs. Project CLEAR launched last month in the six Brooklyn South precincts with the highest overdose rates: the 60th Precinct (Coney Island), the 61st Precinct (Sheepshead Bay), the 62nd Precinct (Bensonhurst, Gravesend), the 68th Precinct (Dyker Heights, Bay Ridge), the 71st Precinct (Prospect-Lefferts Gardens, Crown Heights) and the 72nd Precinct (Sunset Park). Gonzalez estimated that the program is poised to serve 700 people this year, based on last year’s arrest numbers, and many more when it is ultimately rolled out borough-wide. City Councilman Chaim Deutsch, whose district includes parts of Sheepshead Bay, told VIN News that Gonzalez’s forward thinking plan would give substance abusers a chance to make a positive change in their lives. “Project CLEAR will give those arrested on misdemeanor drug charges a choice that will prevent them from having a criminal record and give them an opportunity to put the brakes on their risky behavior by providing them with a path to redemption and proper care,” said Deutsch. This is a wonderful idea. Hatzlacha! how sad and true. may Hashem console him. I wish them all luck!! Mr. Klein, you are a strong courageous man for all that your doing. Rather than hiding behind a wall of shame you became an advocate for other victims. It takes courage and grit. We don't know the way of Hashem but Malky's tragedy may result in far fewer causalities along the line thanks to you. May Malky's neshoma have a zechus and alyia from this and may she have a lichdiga gan eden!